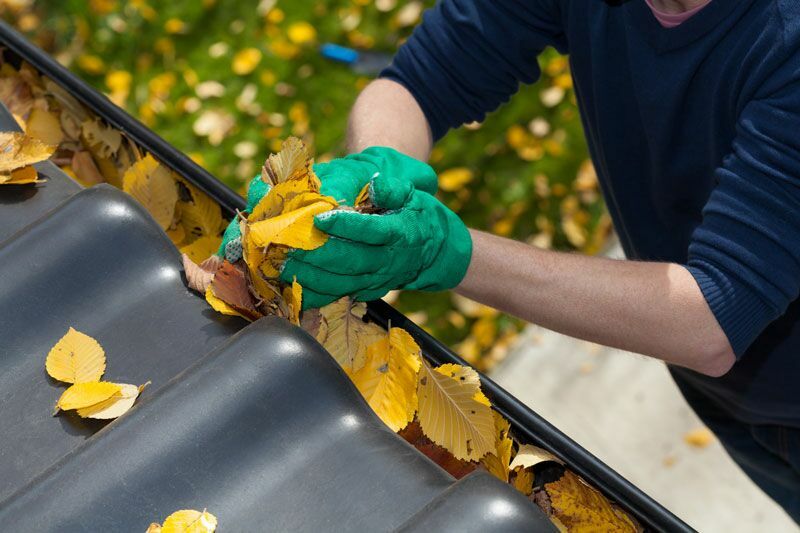 Cleaning your gutters is an important part of fall home maintenance. Learn the best way to clear out your gutters this fall. During fall, leaves can accumulate and clog your gutter and downspout. While this may not seem like a serious issue, it could result in damage to your gutter, flooding, and in extreme cases, water damage to your home’s foundation. Cleaning out your gutter is the best way to prevent these issues. With winter rain and snow ahead, use this guide to learn out how to clear out your gutters today. Safety First: While cleaning out your gutters is a fairly straight-forward process, it can still be dangerous. Cleaning out your gutters requires you to climb up a ladder, so you should never undertake this activity when it’s windy, raining, or snowing. Additionally, you shouldn’t use a ladder when you’re alone. Make sure someone knows what you’re doing, or better yet, have someone assist you while you’re cleaning. Gather Your Supplies: Cleaning out your gutter doesn’t require any fancy tools or equipment. All you need is a ladder, bucket, work gloves, and a hose with a nozzle attachment. If you have them, a tarp and a screwdriver are helpful, but they are not necessary to complete the task. 1) Position your ladder near the downspout. If you have one, place the tarp under the section of gutter you will be working on. The tarp will catch any falling debris and make for easy clean up. 2) Climb up the ladder and have someone hand you the empty bucket. If possible, secure the bucket to the ladder so you don’t have to worry about it falling. Using gloved hands, scoop large debris out of the gutter and deposit it into the bucket. Continue this process for the entire length of gutter. 3) Once you’ve removed all the large debris, use the hose with nozzle attachment to clean out the smaller stuff. Spray enough water to flush out your gutter and downspout. 4) If you brought a screwdriver, look for any sections of loose gutter and tighten them completely. If you notice any damage or are concerned for your safety at any point in this process, don’t be afraid to ask for help. Trust a licensed roofing professional with any questions you may have. Cleaning out your gutter is an important step in preparing your home for the coming winter weather. Another way to make sure your home is prepared for anything that comes its way is having the right home insurance coverage. For questions about your policy, contact the experts at The Schwab Agency in Colleyville, Texas. Our dedicated team is ready to serve all your insurance needs!